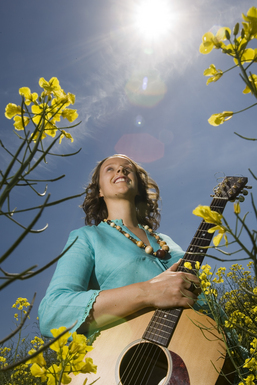 Denise Hagan is an inspirational Irish singer/songwriter originally from Co. Armagh. Her debut performance in July 2003 was as support to Shania Twain. Her songwriting ambitions have been credited by Sterling Sound Studios, New York where Lennon, Springsteen, Jewel and The Strokes have mastered their albums. Denise has been singing and writing songs since she was at school. Even then it was clear that she was a young woman with a very special talent and a bright future. She continues to work with her own distinctive song writing and vocal style. Her songs are immediately identifiable by their powerful lyrics, many of which are deeply spiritual, and are presented in a variety of styles ranging from folk, to jazz all the way through to rock'n'roll. Of course I'd be very happy to share an endorsement with this fabulous project!!!! Many thanks for your work already . . . it's truly amazing. This magnificent project is such an enormous gift to our world that I can't speak highly enough of it. It is a jewel for every man woman and child on this earth and its magical appeal is in its universality and simplicity. I hold the vision that every person on earth will soon wear this beautiful peace symbol upon their arm so that we all might remember the One Love from which we come.